Robert Hirshfield sees a sign only he can read: Only Those Serious About Their Souls May Enter Here. My tiny digital camera weaves and bobs on the security belt. I am scanned from armpit to ankle. I tingle. Is it because I feel myself threatened, or because I feel myself a threat? The Israeli policeman waves me through. I am cleared to pray. The roar of prayer sweeping across the plaza from the Wall makes an angry sea sound. Jerusalem suffers from being a holy city on the bank of no river. It needs water. Water would wean it off words. Would help wash down the tonnage of scripture that has gone into making this city. The Wailing Wall sat on our kitchen table in the Bronx. Wrapped around the family charity box, it looked brittle from centuries of being touched and wept upon. It seems to have grown younger, stronger, with time. 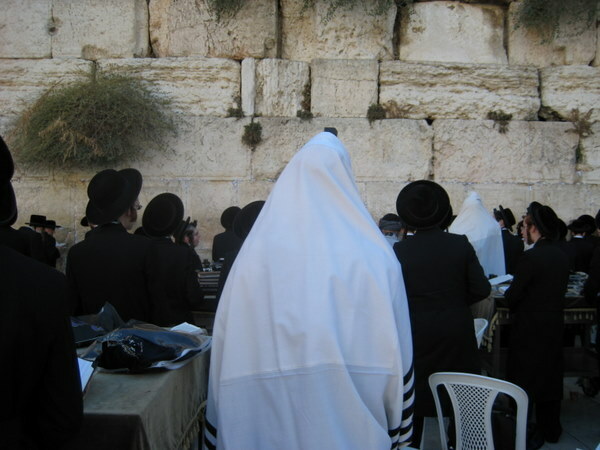 Hasidim quake like black-jacketed exclamation marks who have arrived at last at the end of days. I see a sign visible only to myself: Only Those Serious About Their Souls May Enter Here. It is early in the morning, and the other spiritually superficial tourists are still asleep. I want to say a prayer for my mother who prayed here once, and who died, prayerless, of Alzheimer’s. I am shy around strangers; it keeps me from talking to God. But here is my chance. 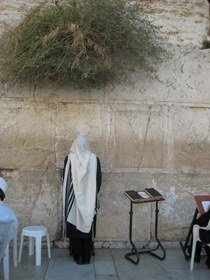 The plaza is a landing strip for prayers, the Wall the Ganges of the Jews. It makes me uneasy. It comes wrapped in too much history for me. Wrapped and re-wrapped. A stone chronicle of destruction, lamentation, resurrection. My prayer, still embryonic, needs a place scrubbed of grandeur. Some place small. Some place I can whisper into. Smaller even than a charity box on a table long ago destroyed. Interested in visiting Jerusalem? Check out the customs you should know about before going.